Special thanks to John “Nemo” Nemerovski, who assisted on this review. For a small amount of money you can buy this small adapter that opens your iPhone’s non-standard recessed jack to an enormous quantity of non-iPhone headphones, earphones, and earbuds. If you are happy with the earphones that ship with the iPhone, or if you already own special-plug compatible headphones, you won’t need this adapter. 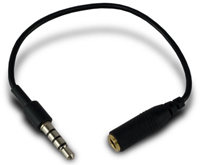 But if you own or want to buy a set of incompatible headphones, you’ll need an adapter such as this one. It’s flexible, almost weightless, with a good fit at each end. This product is excellent value for a simple solution. A slightly thicker cable would make it more robust. NOTE: The following four items do not require a jack adapter. Third party headphones often fit better and sound better than Apple’s earbuds. With this microphone extender cable, any and all non-microphone equipped headphones can be used both for music and conversation with an iPhone. Built-in features are an on/off switch and a small stability clip. We tested it using original Apple white iPhone ‘buds. Listeners on the receiving end of iPhone calls said the microphone quality was crisp and clear, albeit with a little too much treble. This gadget has a lot of potential; plenty of people who already own good-quality earbuds don’t want to give them up when they purchase an iPhone. The fly in the iPhone ointment is that the iPhone’s audio jack is not a standard mini-jack receptacle; Apple has engineered it to require a slightly longer plug. 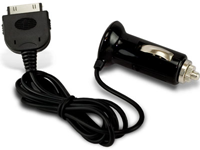 Newer’s Mic Extender is an an adapter plug with an in-line microphone. You can use any earbuds, and Newer adapts the plug, and provides the microphone, as well. For the iPhone user, the price is right, and the product does exactly what it’s supposed to do. These earpiece drivers are nicely angled for a comfortable fit, with asymmetrical cables left/right. Noise cancellation is minimal, as is bass response. The audio is not something you’d write home about, and it isn’t much better than Apple’s original iPhone buds. You can’t beat the price on this single solution for iPhone listening and talking. Voice quality is at the “just okay; good but not great” end of fidelity compared to others we’ve used, but none of them is especially noteworthy in the conversation category. For music playback, these buds are rather a dud, but again are exceptional value for money. The company web site offers two raves, including one by our pal Bill Palmer. When you’re on a tight budget, this mic/earphone will suffice, but considering how much you’ve spent on iPhone and monthly service, MyMac.com recommends you instead choose a superior competitor. These buds may not be for you if you REALLY want improved bass response, friends, but they do a good job for the price. Our listening panel can’t determine if the audio is in any way better overall than NewerTech’s iPhone Hands-Free Mic & Earbud, reviewed just above. The recessed-jack compatibility is a plus, but if you only want to spend $20 to achieve enhanced bass, you’re out of luck. For best buds per buck under $50, we still recommend these, reviewed here. 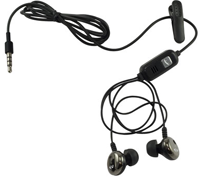 On a positive note, the NewerTech “improved bass” earbuds share the exceptional comfort and value of the other items we’re evaluating in this roundup. Thirteen dollars will not be your lucky number if your car’s cigarette lighter cavity is on a diet. This charger won’t fit into Nemo’s VW Beetle’s three 12V accessory outlet, and insertion in Weeks’ car was possible only by squeezing hard on the plug’s little springs and pushing harder than should be necessary. Once inserted, auto iPhone charging was effortless. If it fits, use it. If it doesn’t fit, give it to a friend whose car is more compatible. MyMac rating: 3 out of 5. Bonus rants: Why do so many companies make it difficult for users to locate “L” and “R”? And why can’t NewerTech provide a couple of different-size eartips, to accommodate all potential earbud listeners?